Lights down, music up. Nightclub-inspired fitness spaces offer an energising, playful way to work out, where you really can move like no one's watching. In the dark, you feel electric – vibrant, warm and exhausted in the best kind of way. ‘90s R&B is pulsing through the sound system, and strobe lights shimmer with the beat. You’re moving freely, your hair and skin sweaty. You close your eyes and feel the music surge through your body like a current. You could be in a club, except it’s 7 pm. You’re dressed comfortably in your compression tights and Nikes. And you’re intoxicated with the feel-good rush of endorphins, the energy jolt of a protein bar, and the pleasure of cool, pure water. From dance classes to spin and even yoga, nightclub-inspired workouts are popping up everywhere. For anyone who's bored of the typical gym studio, glow-in-the-dark fitness classes inject a bit of playfulness and novelty that can get you feeling reenergised about working out. It's super dorky, but that's what makes it so fun. There's something about the dark space that's really freeing. When you can let go of any thoughts of what you look like, the experience becomes more about how your body feels. Alice Glenn, co-founder of dance community No Lights No Lycra, says this can provide vital relief in a world where we’re constantly on Instagram and focused on visuals. No Lights No Lycra was created by two dancers, Alice Glenn and Heidi Barrett, in 2009 in Melbourne. There are now dance nights held all around the world, bringing people together to let loose and express themselves in the freedom of a dark room. It’s nothing like a dance class, where you have to think about steps and technique and coordination. There’s no teacher, no instructions and no pressure to dance ‘properly’. Whether you want to do the robot, practice your best Beyoncé moves, or just jump around, it’s a safe space to let go and do whatever you like. Dancing around for an hour will definitely get your blood pumping. But the real allure is the exhilaration it gives you, and the feeling of community. When it comes to aerobics, the more retro and dorky the better. At Clubbercise, neon Lycra is encouraged, feel-good club anthems are blasting, and everyone gets a pair of flashing LED glow sticks to get into the groove. The concept started in London and is growing in popularity around Australia, with classes held in all different spaces, from gym studios to community centres to actual nightclubs. “For those who love to dance the night away clubbing, or who feel self-conscious in a brightly lit gym environment, the darkened room combined with pumping tunes – from the 90’s to the latest chart hits – strips away all inhibition,” Burlison says. Let’s face it – traditional spin classes can be misery. 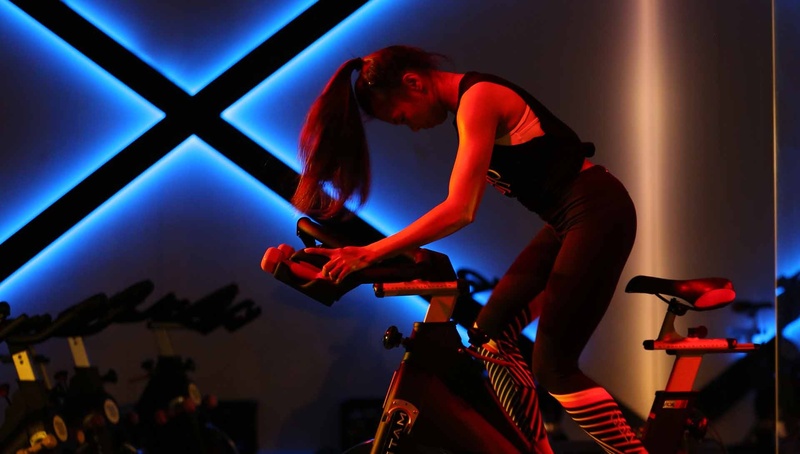 At boutique fitness studio Bodhi & Ride, a fierce cardio workout is combined with a vibrant party atmosphere. “It creates an energetic – and sweaty – fitness experience where riders can find a release,” says founder Michaela Fellner. The ride chamber is dark, with pulsing neon lights and bikes nestled close together like a crowded dance floor. The music is an essential part of the experience, with DJ-mixed soundtracks set to themes like Lady Gaga vs Madonna and R&B Tuesdays.